There was one big exception to this lack of planning, however. Long before we landed on Asian soil, even before we departed the United States, we knew we would make it to Korea. To begin with, we are completely head over heals with – yes, you guessed it! – Korean food. 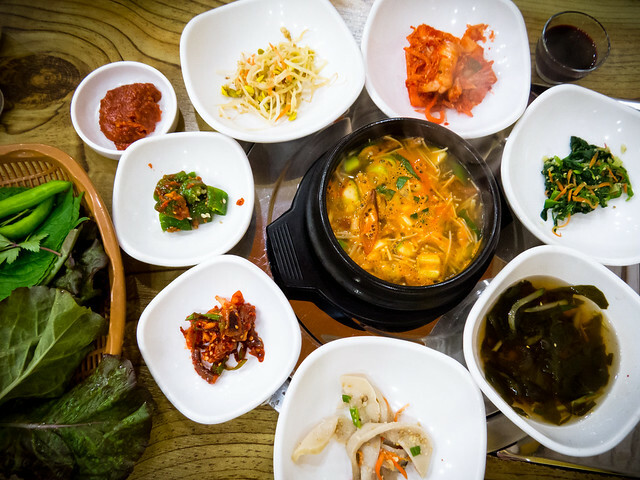 For years we’ve been nearly obsessed with the country’s cuisine: from Korean barbecue, bibimbap and bulgogi to kimchi and the rest of the banchan, those glorious bottomless side dishes that accompany most every meal. 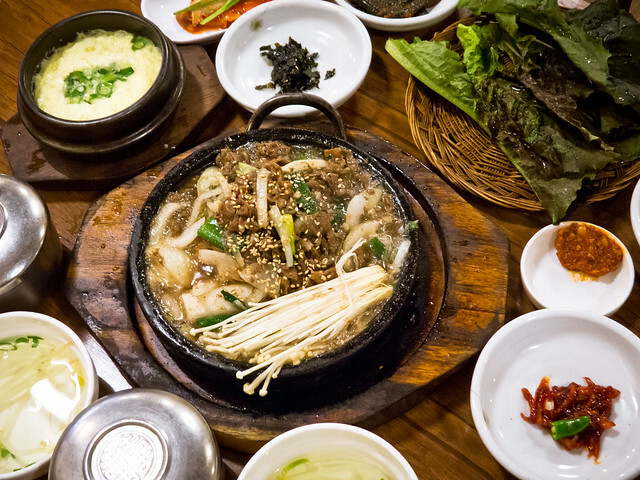 And now that we’ve been here for over four weeks we can share one of our biggest discoveries: when it comes to food Korea does not disappoint. 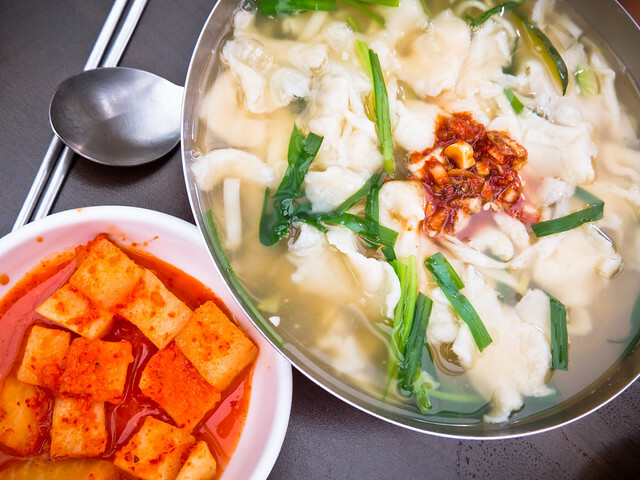 Though we knew our way around a handful of popular Korean dishes, we undeniably had a lot to learn and looked forward to furthering our education. 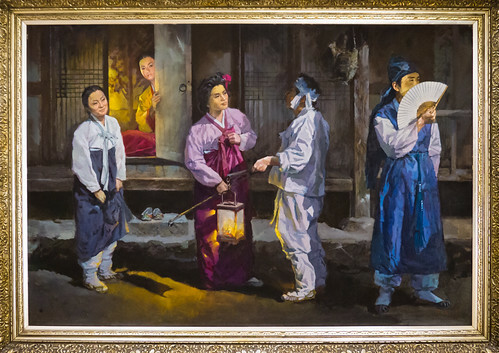 What we found is that along with the country’s cuisine, its dining habits, rules and general culture are so much more complex than we could have imagined. 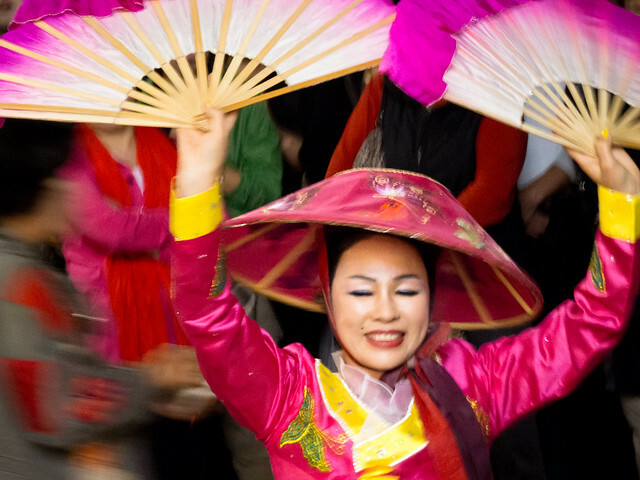 Here are just a few examples of Korean dining, serving and drinking etiquette, each steeped in generations of history and culture. Respect for elders requires that the oldest person at the table pick up their spoon or chopsticks first – everyone else must wait. Once they put them down, this indicates that the meal is over and the younger diners must do the same. Never, ever, pick up a bowl of rice or soup. 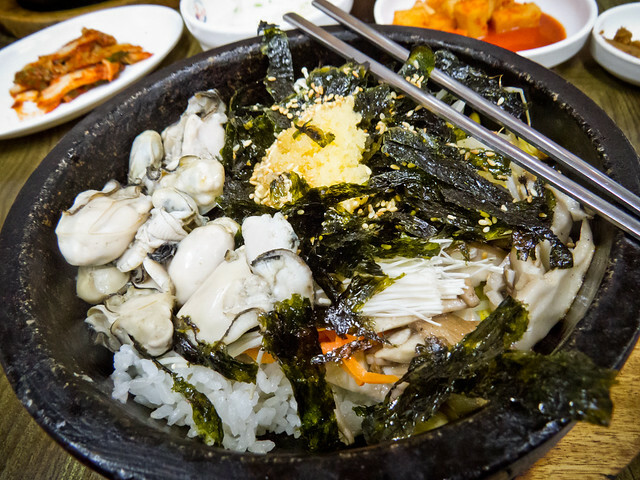 Unlike in China or Japan, showing the bottom of a bowl in Korea is seen as incredibly rude. Koreans drink – a lot. 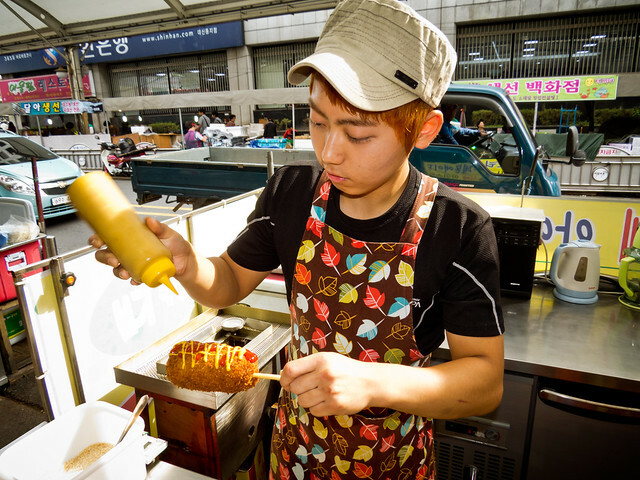 They love makgeolli, beer, soju and fruit wines of all varieties and drink them at all hours of the day – even in public. But, there are also rules for drinking alcohol, not just dining. When at the table one must turn their head away from elders while (silently!) sipping the beverage of their choice. Essentially competing to see who can be the most polite person at a meal is very typical. The winner is the person able to fill others’ wine or water glasses, serve food, hand out napkins and refuse to eat the last bite of a banchan. 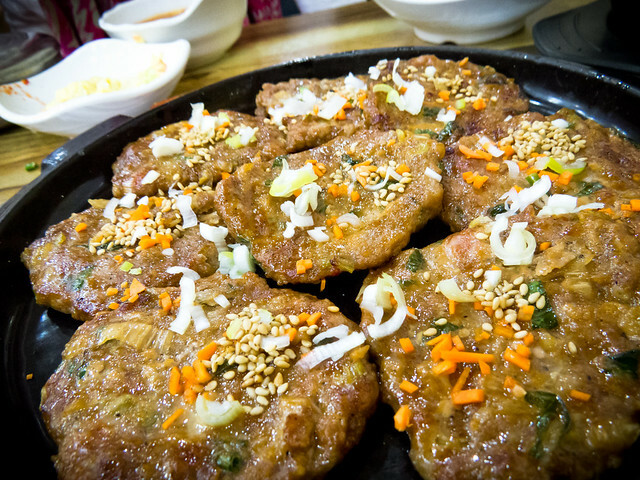 Even the most standard of Korean meals in some ways replicate the surasang, or Korean royal dining table. Each side dish is different in color and divided into yin and yang energy foods. The result is a work of culinary art, a table draped in stunningly beautiful platters and visually stimulating dishes. 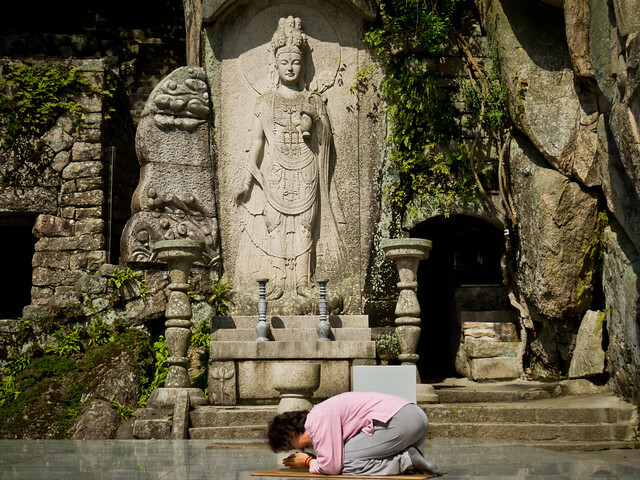 Of course, Korea is much more than just a country of delectable food and drinks. In our four weeks we discovered this through visits to seven cities, zigzagging our way through the country by train and bus. We were spontaneously invited to dine in the homes of locals and were even gifted hand-crafted artisanal gifts from local shop owners. We learned about the lives and jobs of the immense number of foreign English teachers all across the country, many of which who so graciously hosted us. 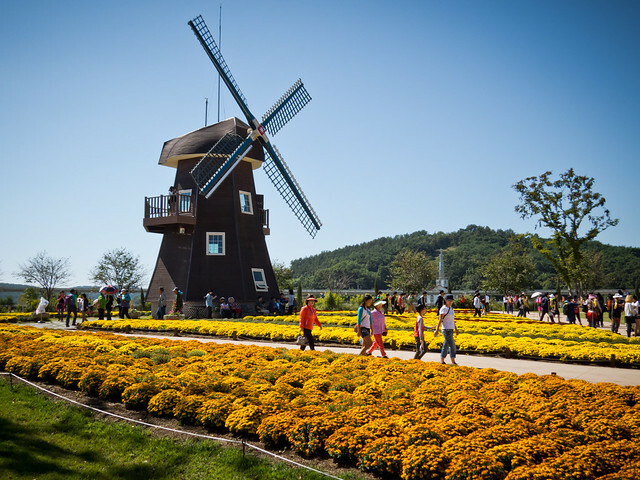 And, as we were fortunate to do in Belgium a year ago, we witnessed the full force of Korea’s fall colors, changing the landscape dramatically as we moved from lush, green Busan in the far south to the mountainous, golden, orange and red hues of Seoraksan National Park in the northeast. As we entered the port via ferry from Fukuoka our first view of Korea was of Busan’s impressive silver skyline on a backdrop of enormous rolling hills, quite a befitting introduction to a modern, mountainous country surrounded on three sides by sea. Once on land we set out to become acquainted with the country. 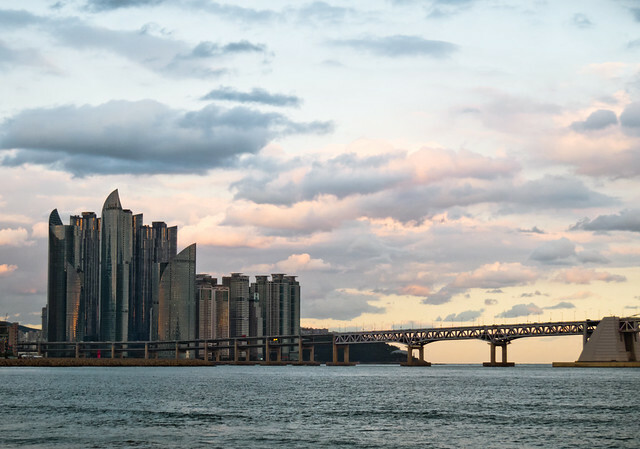 We visited several of the city’s markets, sampled street food and Korean barbeque, and sat at Gwangalli Beach with a bottle of soju, admiring both the bridge and the surfers as the sun set behind the city. And though we weren’t dressed accordingly when compared to the locals (Koreans seem to be absolutely obsessed with North Face-esque adventure sports gear), we joined in on Busan’s favorite activity of hiking, taking to two of the many parks surrounding the city – Amnam Park and Geumjeong Mountain, home to the marvelous Seokbulsa Temple. 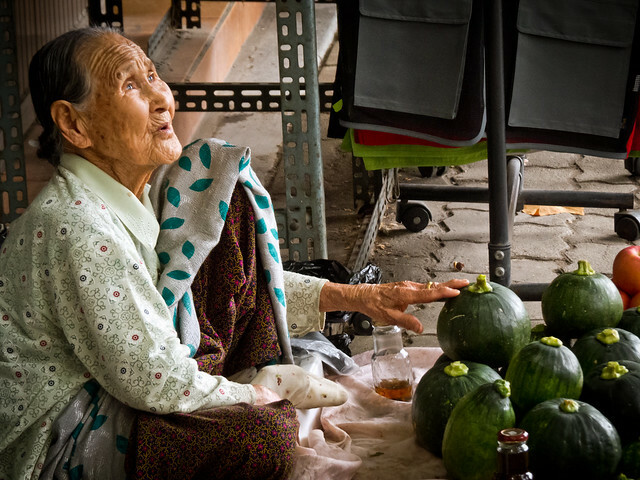 Our first glimpse of Korea was of a country with a healthy passion for food, fitness, and nature as well as a rather heavy dosage of drinking culture – we felt right at home! 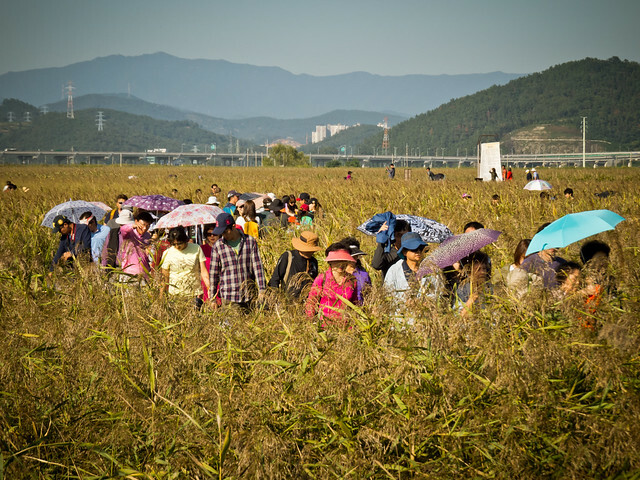 Suncheon, the self-designated “Ecological Capital of Korea” was our next stop, just a few hours west of Busan on a meandering slow train through pastures of pink flowers and endless wheat fields. With our hosts Christi and Steve, two American expats teaching English in local universities, we spent our first day in the area casually walking through the gardens and parks of Namwon, a town just 40 minutes away by train. 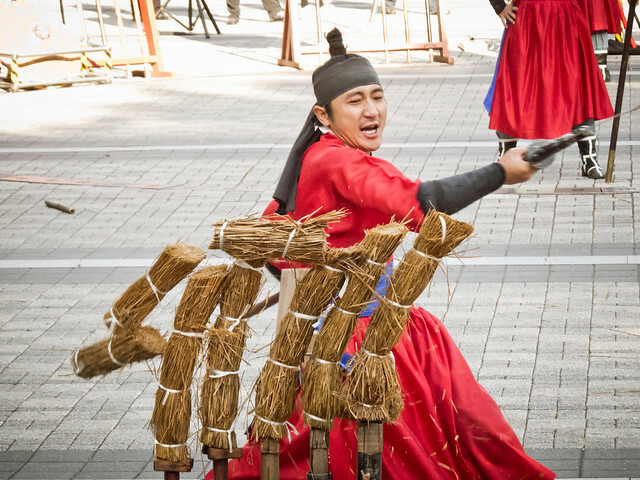 Since a park within the town celebrates the nationally famous love story of Chunhyang, Namwon has dubbed itself “The City of Love” and now holds an annual festival commemorating the folk tale of these two torn-apart lovers. 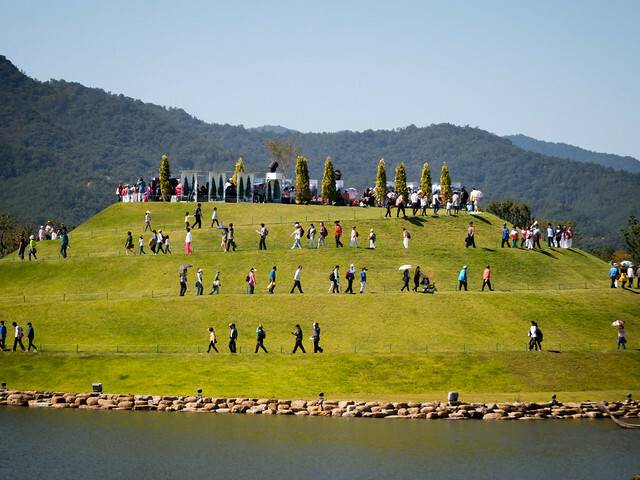 The following day we visited – along with tens of thousands of school children and retirees – Suncheon’s current big attraction, the 2013 International Garden Expo. 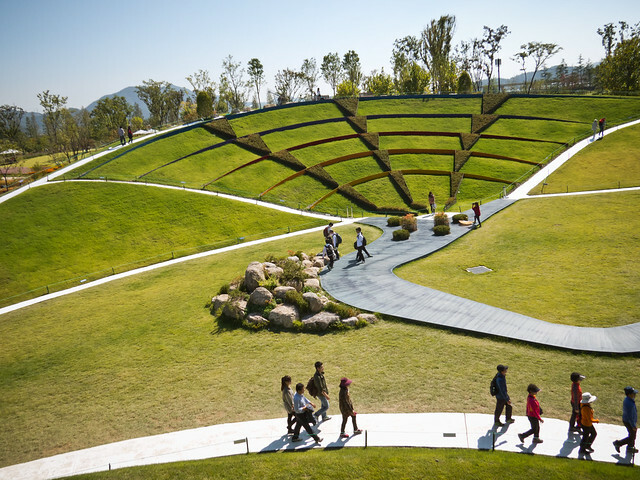 A six-month long event, the expo showcases a large array of both traditional Korean and international gardens, including a modern-looking yet very generically designed American garden. 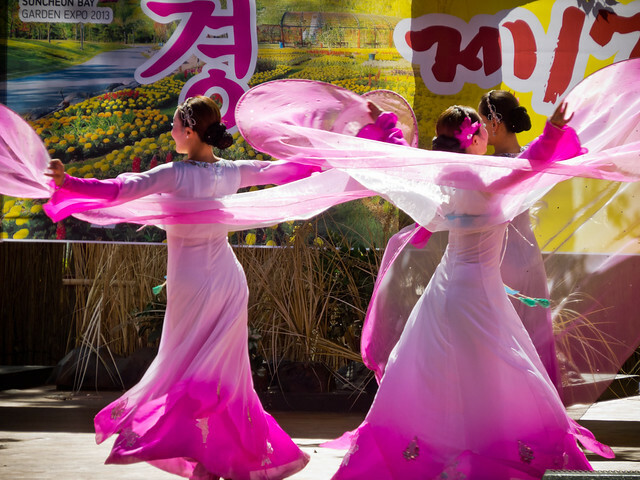 We visited Suncheon at the tail end of the expo, but were astounded at the sheer number of visitors still lining up at the gates each day, the variety and complexity of the gardens, and the beautifully performed traditional songs and dances on the main stage. 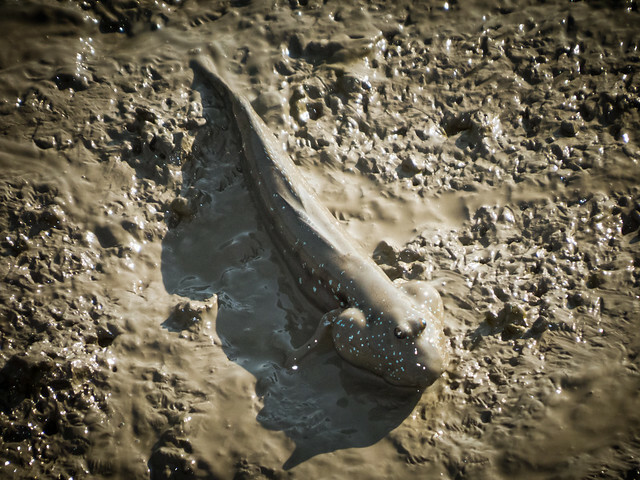 The co-headlining wetlands visit to Suncheon Bay Ecological Park was equally as memorable, with tiny creatures (mud skippers, crabs and fish) thriving beneath the boardwalk despite the stampede of thousands of tourists. 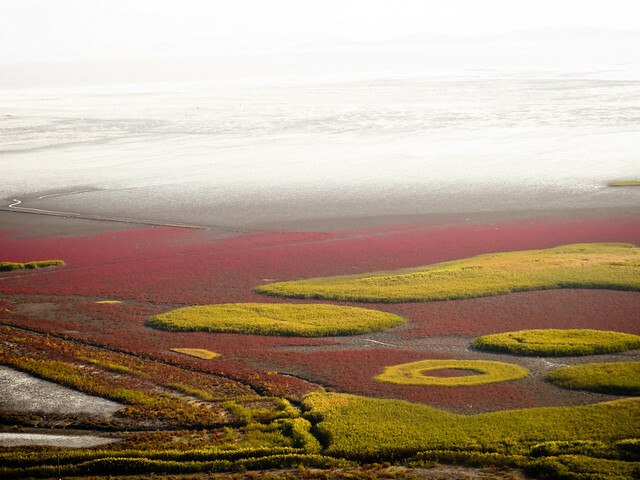 From a nearby mountain overlook we were able to get away from the majority of the masses to view from above the wetland’s natural wonder of colorful, floating reed structures. 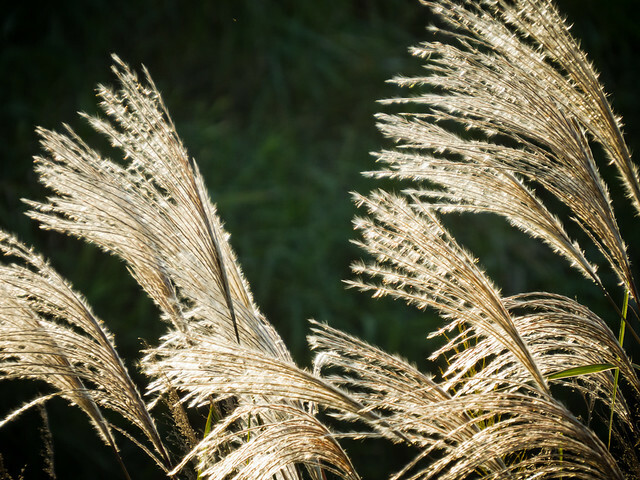 As our visit coincided with the beginning of fall the red reed blossoms were in full bloom and migratory wild turkeys roamed the area, seemingly oblivious to the masses of admiring people. Next we headed to Daegu, where our goal was rest and recovery from almost ten days of constant hiking and traipsing around the coastal region of the south. Though we vowed to continue immersing ourselves in Korea’s culture of food and drink, we also took our physical activity level down a notch. 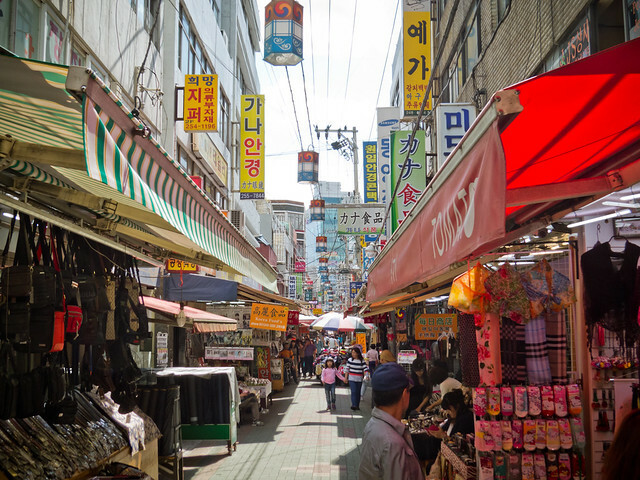 We very calmly explored the city’s massive Seomun Market and a few of the many malls, browsing in all the shops and purchasing a few gifts. In the evenings we participated in a bit of barhopping with our local host, Jason, as well as noribanging, or drunkenly singing karaoke in a private room. 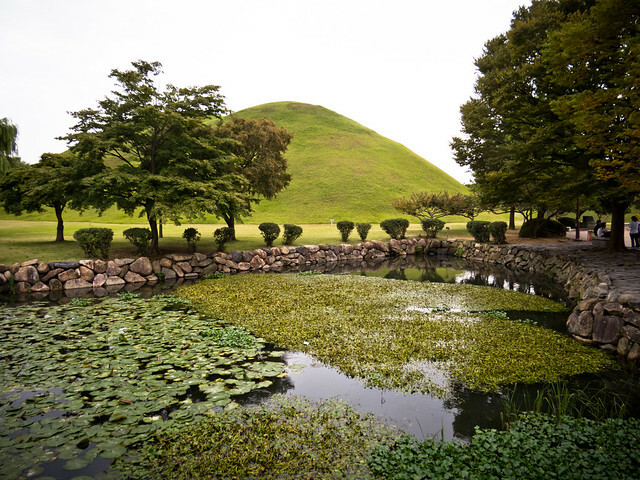 Less than an hour and a half from Daegu is Gyeongju, a prehistoric settlement and ancient capital full of interesting parks, museums and gardens. 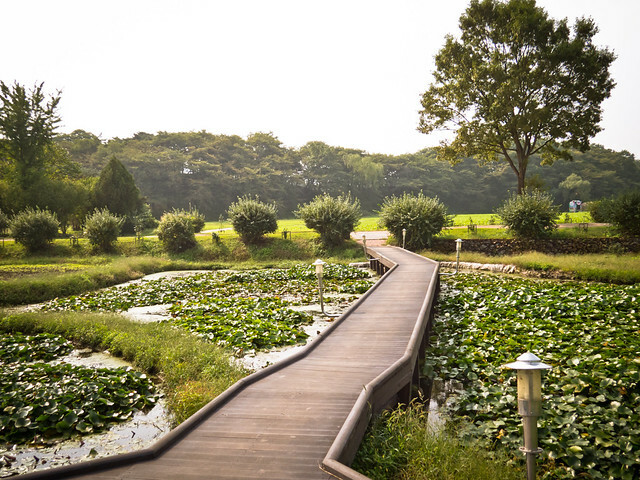 The town is steeped with history and sites to see, from the National Museum and Tumuli Park to the re-built historic villages, beautiful foot bridges, royal tombs, and Anapji Pond. 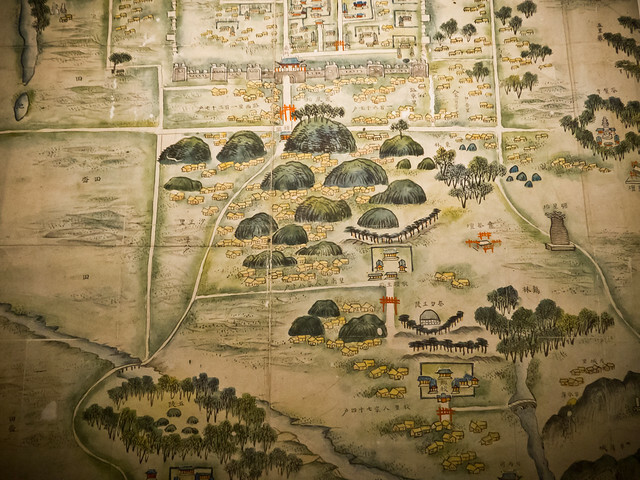 We spent two short days in Gyeongju but could have easily taken a week to see the rest of the town’s many sites. 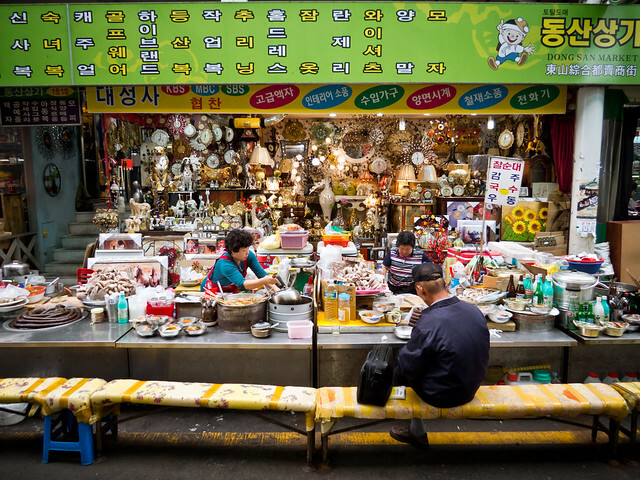 Ask anyone who lives or has lived in Seoul and they’ll tell you: “Seoul is Korea.” Though we don’t entirely agree based on our more than three weeks traveling through other parts of the country, we can see what they mean. 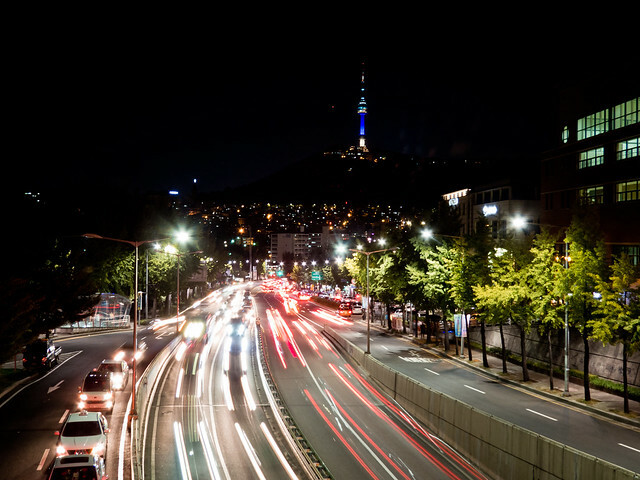 As the third largest city in the world Seoul is huge! 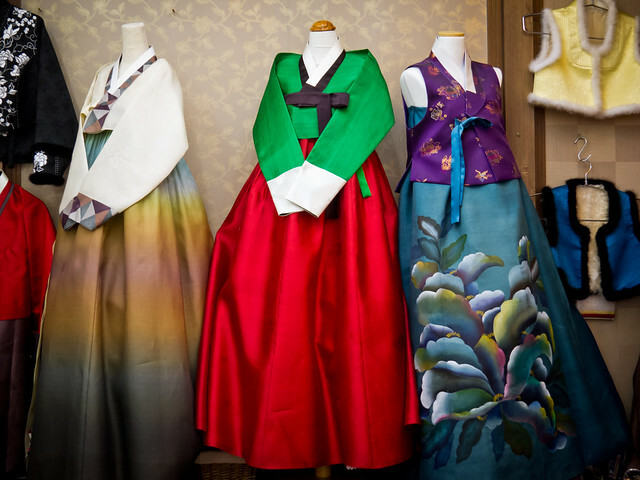 We really enjoyed our time there, shopping in Insadong, attending the Itaewon Global Village Festival and browsing the Dapsimni antique markets. 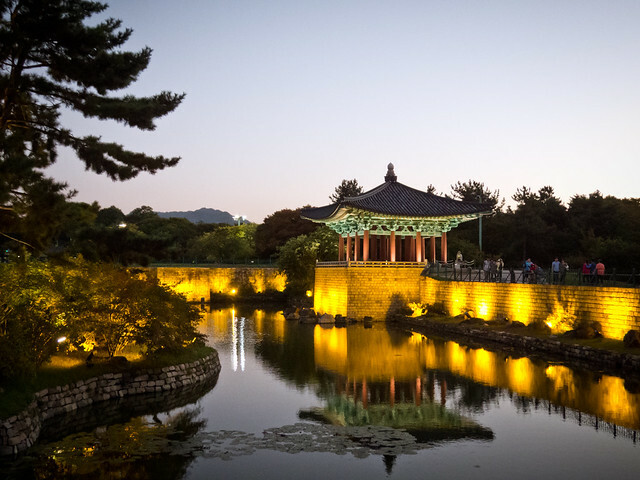 We hiked up Namson Mountain to Seoul Tower where free cultural performances were being given, sifted through the Yongsan Electronics Market and topped it off by scrubbing, soaking and relaxing away a day at Dragon Hill Spa jjimjilbang. 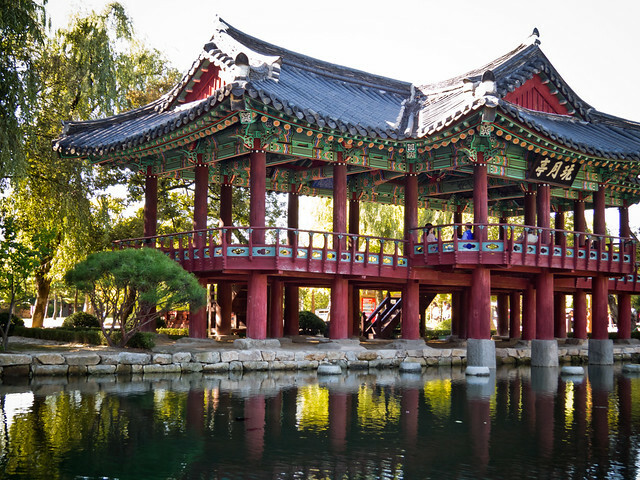 Seoul is clean (though not “Tokyo clean,”) has great public transport, and tons of museums and free cultural activities. We loved it! 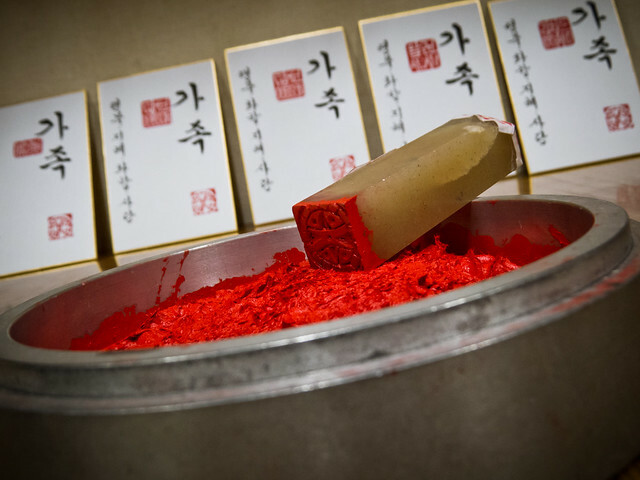 One incredibly fun and creative project we worked on while in the city was having several stone dojang, or traditional signature stamps, carved. 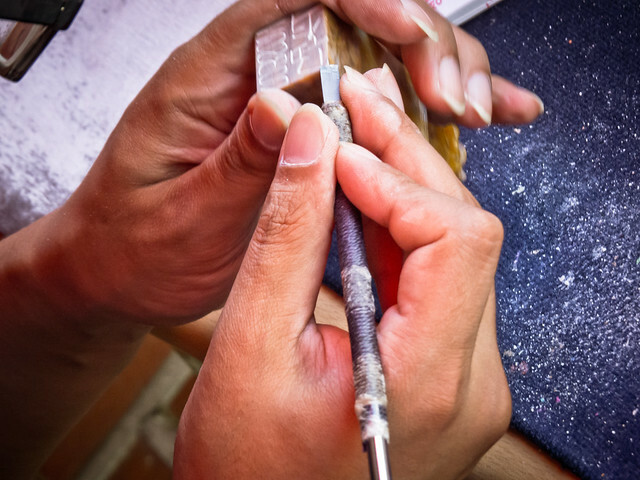 It was a multi-stage process that consisted of selecting beautiful stone stamps, designing carvings, finding an artisan available to carve them and finally finding a calligrapher to produce for us beautiful hand-drawn certificates for the stamps. Now, while we could have definitely done this all at one single shop we instead wanted to have more flexibility in choosing the stones and the calligrapher. As a result we spent an entire day in Insadong accomplishing our task in the calligraphy shop of several generous and incredibly creative artists. After several hours we left with bags full of carved stamps, beautiful stamp boxes, certificates and an additional custom-made, hand-carved dojang that was gifted to Theresa by a particularly friendly store owner. The final products of our day are absolutely beautiful, accompanied by gorgeous boxes and hand-drawn certificates. Back in Japan we had peeked into a cat café – a locale where one can sip on tasty beverages while in the company of many sweet cats and kittens. We thought that the same concept, but with dogs, would be fantastic! 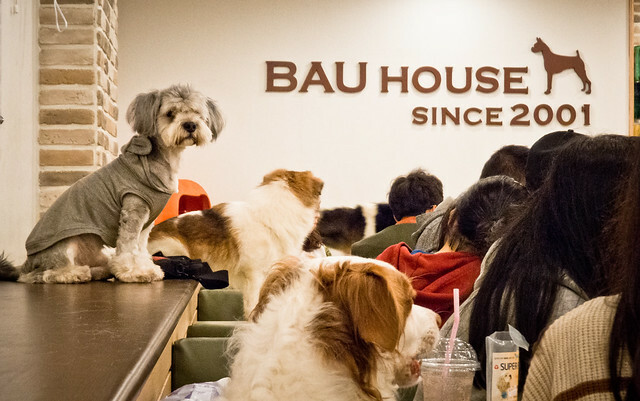 It just so happened that in Seoul there exists such a place: Bau Haus! It is one of the more unique cafés in Seoul and was the perfect location to celebrate Theresa’s 30th birthday. 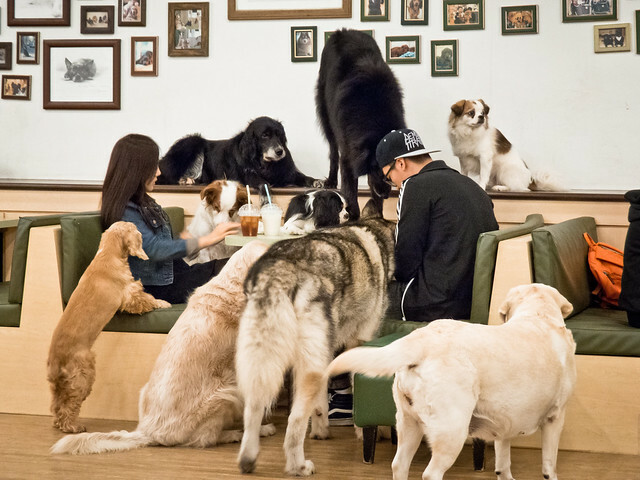 Bau Haus is home to around twenty fat and happy dogs who laze around and chase toys all day while dog lovers come and go, playing with them, offering the dogs treats and cuddles. It was a fantastic and very fitting way for two major dog lovers to celebrate a birthday, as we dearly miss our little guy, Cuzco. We cannot wait to see him in the coming months! 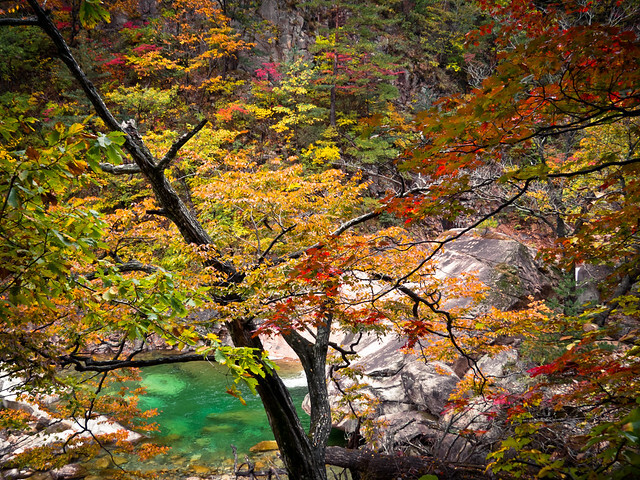 Our last stop in Korea was the spectacular Seoraksan National Park in Sokcho. 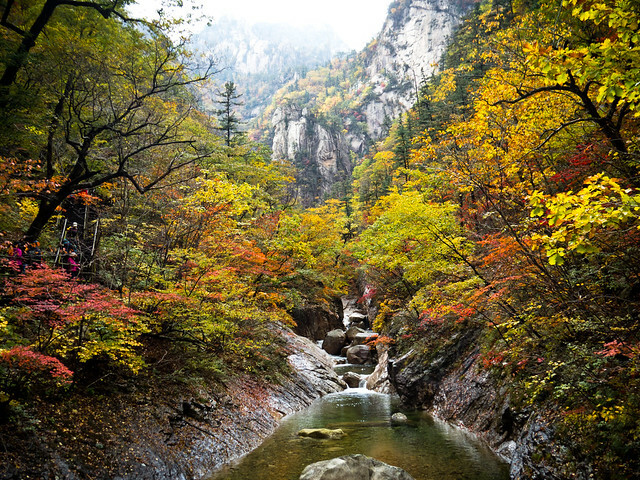 Located far in the northeast corner of the country, Sokcho is one of the coldest spots in Korea and so the first to experience the intense changing of the colors of fall. So, while we were fortunate enough to fit in a visit to the national park during such a beautiful time of year, we were also amidst enormous throngs of locals who shared our interest in the fiery colors of autumn. 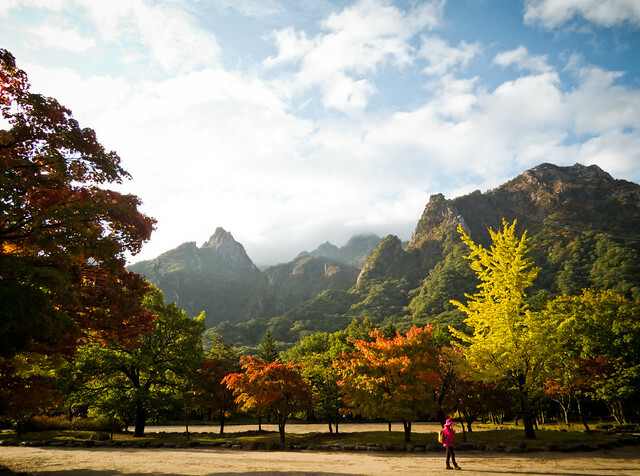 We spent one complete day hiking through the valleys amidst the spectacular changing leaves as Seoraksan’s mountains peeked through the hills at us. We are now moving onto the Philippines where we’ll be avoiding winter for just a while longer. 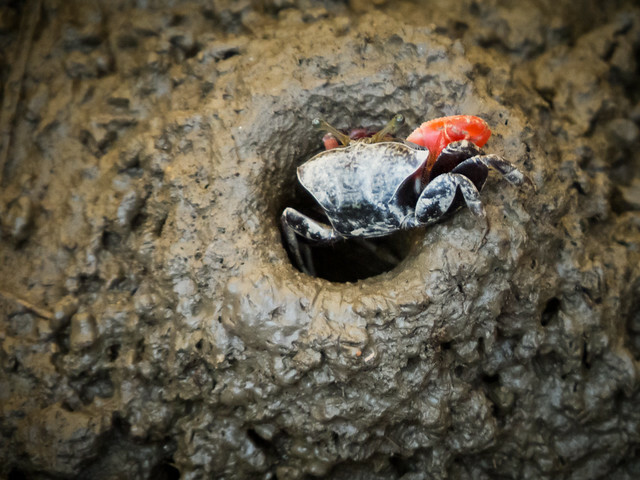 We’re planning several weeks of island hopping, scuba diving with thresher sharks, staring contests with tarsiers, and getting to know a brand new culture. Island life, here we come!